Provide world-class education to physicians in multidisciplinary pain medicine who will then meet the needs of the community and beyond, by advancing the art and science of pain medicine and assume leadership in the field. The University of Washington’s history of leadership in pain medicine began in 1960 when Dr. John Bonica started the world’s first multi-disciplinary pain clinic. To learn more about Dr. Bonica’s story watch this TED Talk. Since then, the University of Washington has sustained the mission of providing cutting-edge, comprehensive and compassionate pain care. We are an international leader in education, research, as well as public health policy. Our fellows train alongside the people who are changing the face of pain medicine today. The Pain Medicine fellowship program is committed to recruiting diverse physicians to meet the changing needs of our patient population. In this context, we are mindful of all aspects of human differences such as socioeconomic status, race, ethnicity, sexual orientation, gender, spiritual practice, geography, disability, career goals, and age. Our objective is to create a climate that fosters compassion, belonging, respect, and value for all and encourages engagement and connection throughout the program. The program aims to recruit candidates who demonstrate excellence in academics, leadership and communication; to create an environment of self-directed learning in order to encourage trainees to become effective lifelong learners; to develop pain medicine specialists who are able to thrive, teach, and lead in all areas of pain medicine. The University of Washington Pain Medicine Fellowship is a one-year clinical program accredited by the Accreditation Council for Graduate Medical Education since 1993. All required clinical education for entry into ACGMEaccredited fellowship programs must be completed in an ACGME-accredited residency program, or in an RCPSC-accredited or CFPC-accredited residency program located in Canada. [CPR III.A.2.] The program must receive verification of each entering fellow’s level of competency in the required field using ACGME or CanMEDS Milestones assessments from the core residency program (CPR III.A.2). The program and the American Board of Anesthesiology does not grant exceptions to the fellowship eligibility requirements. Effective July 1, 2016, new eligibility requirements for prerequisite training for entry or transfer into ACGME-accredited residency programs and fellowship programs take effect. These are detailed in the Common Program Requirements Effective July 1, 2016 and the One-Year Common Program Requirements Effective July 1, 2016 on the ACGME website. Candidates must ensure they are eligible for a Washington State provider license, be authorized to work in the United States at the time of appointment and meet applicable essential abilities requirements of the program. The Pain Medicine Fellowship Program accepts foreign national physicians who meet the eligibility and selection program requirements. Foreign nationals requiring visa sponsorship must obtain a J-1 visa sponsored by the Educational Commission for Foreign Medical Graduates (ECFMG). The UW and Pain Medicine Fellowship program does not generally provide H-1B sponsorship for fellows in its clinical training programs unless the fellow is otherwise ineligible for a J-1 visa. *Applicants need to request from programs prior to ranking, consideration for H1-B visa. Applicants cannot be ranked or accepted into the fellowship program until the program receives approval by the GME Office and ISO/Academic HR for an H-1B visa sponsorship. Please see Pain Medicine Fellowship Program Eligibility & Selection Policy (PDF) for more information. Our pain medicine fellowship offers a close-knit and supportive learning environment that challenges our fellows to become active learners and skilled teachers. We have five unique training hospitals in the Seattle area allowing our fellows to experience many different practice environments as they determine what type of environment is right for their future practice. 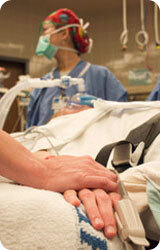 University of Washington Medical Center (UWMC): The Center for Pain Relief (CPR) is located in the Roosevelt Clinic. It is the hub of the fellowship and the location of the didactic sessions and Fellows Clinic. CPR offers outpatient clinics, a procedural suite equipped with a 3-D CT scanner, and fluoroscopy. Please visit the UWMC website for more information. 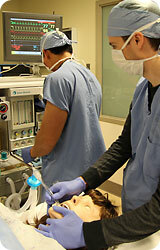 Harborview Medical Center (HMC): Each fellow spends six weeks at HMC. HMC has outpatient chronic pain clinic and procedures, however its main strength is the inpatient pain service. It is the only level 1 trauma center in the five states of the WWAMI region (Washington, Wyoming, Alaska, Montana, Idaho). Please visit the HMC website for more information. 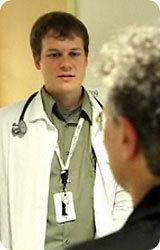 Veterans' Affairs Puget Sound Health Care System (VA): Each adult pain fellow spends two months at the VA. The VA has a comprehensive, cutting-edge pain and functional restoration center. Fellows rotate in the Pain and PM&R clinic located at the main campus in Seattle and travel weekly to American Lake campus located south of Tacoma. For more information, see the VA website. * Fellowship year starts August 1st of each academic year. A weekly foundations didactic required for all our fellows using a flip-the-classroom teaching technique. At the beginning of the year each fellow selects topics of interest and works with a faculty member to create a quality, interactive and relevant didactic for the group. The presenting fellow and faculty send out reading/video material ahead of time so everyone is prepared for the discussion-based session. You can learn more about the flipped classroom here. There are five fellowship positions available for individuals who have successfully completed a residency accredited by the Accreditation Council for Graduate Medical Education (ACGME) by the fellowship start date. We also offer a one-year ACGME-accredited Pediatric Pain Medicine Fellowship. This position is open to fellowship trained pediatric anesthesiologists, pediatricians, pediatric neurologists, family practice physicians, and child psychiatrists. We also offer a “Clinical Teaching Tract” for interested in fellows. This tract involves using elective time to take part in the UW Teaching Scholar program. The University of Washington and Seattle Children’s Hospital are one of only a handful of programs in the United States offering a fellowship focused specifically on pediatric pain that leads to sub-board eligibility in pain medicine. The program aims to train the next generation of leaders in the field of pediatric pain. The successful graduate will possess the knowledge and skills necessary to diagnose and treat an array of acute, recurrent, and chronic pain problems across pediatric age ranges and developmental levels. While rooted in the general pain medicine fellowship, the pediatric pain fellow will spend more than half of his or her clinical time immersed in the pediatric setting, gaining experiences that are focused specifically on children and adolescents. A year-long continuity clinic in the pediatric setting is core, as are rotations on the inpatient pain consultation service. There are also key rotations in pediatric regional anesthesia, pediatric neurology, pediatric rehabilitation medicine, pediatric palliative care, and child psychiatry. These experiences, combined with those available at UWMC and Harborview, will provide the trainee with a strong foundation in the diagnosis, medical management, and procedural skills needed to practice pediatric pain medicine. The program will also equip fellows with the skills needed to work with an interdisciplinary team, interface with other pediatric specialists in the care of children with pain or discomfort, and to advocate for enhanced prevention and treatment of pain conditions in infants, children, and adolescents. Applications are accepted via the Electronic Residency Application Service (ERAS) which is administered by the Association of American Medical Colleges (AAMC). The Pain Medicine fellowship program participates in the December match cycle. If you are an interested non-anesthesiologist, you should apply to this position as well as the regular pain medicine position described above. This one position is open to a pediatric anesthesiologist, a pediatrician double boarded in anesthesiology. Pain Faculty biographies found here.